No great surprise then that this new version of The Man From U.N.C.L.E is not perfect. To be fair though I only have one objection, albeit a fairly large one, and generally Guy Ritchie’s movie has a great deal to recommend it. Let’s start with my one negative. I’m afraid it’s the two leads. I don’t think it is entirely the actor’s fault but they’re just not likeable enough. Henry Cavill is suave but too smug as U.S. super spy Napoleon Solo and Armie Hammer, as his Russian equivalent, is a little hard hearted and inaccessible. This is exactly as the parts are written but neither of the performers quite have the charisma to pull it off. Apparently Clooney and Damon were once set to play the parts and in trying to find adequate replacements they’ve ended up with a dishy yank Blackadder and a Lacoste version of Schwarzenegger’s cop from Red Heat. Now we have this out of the way though, I can tell you that around these two men spins a highly engaging (if not always highly exciting), often funny, stylish and quite old fashioned espionage flick. It isn’t built around huge action set pieces like so many of the big Summer films we get today, rather it is an atmospheric and light hearted spy romp. In fact in all of this it feels a lot like the source material. The original Man From U.N.C.L.E show ran from late 1964 to early 1968 and watching it now the most immediate comparison is Adam West and Burt Ward’s Batman. Both had the same exaggerated opening narration, overblown swinging soundtrack and blurred image shot transitions. Initially the adventures of American secret agent Napoleon Solo and his Soviet partner Illya Kuryaken were more serious in tone than those of the dynamic duo but by series three it had taken on the same kind of campy humour. Unsurprisingly the main influence on the show was a certain 007 who had debuted in cinemas just two years previously. Ian Fleming actually consulted heavily on the U.N.C.L.E concept but Bond producers Saltzman and Broccoli and their lawyers demanded his name be removed from the credits and all publicity. The series also owed some debt to Hitchcock’s North By Northwest where an innocent everyman got caught up in a spy drama. Solo and Kuryaken were both highly trained specialists of course but the show always featured a civilian whose experience or connections would be required for the mission. Apparently North By Northwest’s Leo G. Carroll was deliberately cast as spy master Waverley to strengthen the comparison between the new show and Hitch’s hit. Imagine them making a television program about trainee wizards now and finding a part for Alan Rickman and you’ll see how that worked. Particularly interesting, given Guy Ritchie’s back catalogue, is another link to a well established narrative. In the official tie in novels, published alongside the broadcast of the show, it was clearly stated that T.H.R.U.S.H, the criminal organisation U.N.C.L.E kept coming up against, was started by Conan Doyle’s villain Colonel Sebastian Moran following the death of his employer Professor Moriarty. Moran as played by Paul Anderson in Ritchie’s last Sherlock Holmes actually film walked away unpunished at the end so perhaps the director is building his own cinematic shared universe. Speaking of which, The Man From U.N.C.L.E inspired subsequent stories itself with Stan Lee citing it as providing the model for his own international crime fighting force S.H.I.E.L.D. Many of the elements of the show have been carried over into this film. There is no sign of T.H.R.U.S.H but Waverley reports for duty in the shape of a scene stealing Hugh Grant and the all important 60s backdrop is also maintained. The movie is imbued the full nostalgia of those who were never there and it is as enthusiastic about the fashion, the cars, the technology, the decor and political climate of the decade as a fevered Austin Powers. It is indeed Groovy Baby. The idea of an innocent member of the public coming along for the ride is also played with significantly and taking this role Alicia Vikander goes a very long way toward making up for her costars’ lack of charm. Vikander’s German mechanic Gaby is recruited by Cavill’s Solo early in proceedings because her father is key to a nefarious plot to build a nuclear weapon. She is no simpering female though. In fact her ability to stay calm under pressure and her bravery in the face of mortal danger initially seems a little unlikely for some one with no apparent experience of such things but this is addressed later. Anyway this is not gritty realism. There are other screen spies ticking that box so that the U.N.C.L.E team don’t have to. It is nice to see that this movie continues what I’m optimistic will be an ongoing trend for strong female characters in action cinema. Following on from Ant-Man 1, Mad Max 4, Mission Impossible 5, Avengers 2 and even Jurassic Park 4 we once again have a woman who is not disproportionately objectified, who moves the action on consistently until the end of the film, doesn’t rely on macho fighting skills and doesn’t constantly need saving . She is sassy, she is fun and she definitely has the Ripley factor. There was a little known spin off show from the original Man From U.N.C.L.E starring Stephanie Beecham called The Girl from U.N.C.L.E and its spirit lives on here through Vikander. Speaking of sequels and continuations this new Man from U.N.C.L.E is definitely set up for one. The whole film is an origin story but this is managed in the best way. It doesn’t have ninety minutes of establishing the characters and what they can do before half an hour of action like so many superhero movies. What you get instead is an adventure that brings people together with a suggestion that they’ll stay together at the end. Interestingly despite the film’s title no one, man or woman, seems to be working for the United Network Command for Law and Enforcement until the last few seconds. If there is a title character then it is Waverley. Hugh Grant really is the star of this film despite only being in about fifteen minutes of it. Another aspect of the original TV series to survive are the tunes. There were any number of reasons for keeping the 60s setting, not least the fact that pairing a CIA and a KGB agent doesn’t have the same significance now no matter how hard Putin tries to bring back the Cold War. Another benefit of not updating it is getting to keep the swinging beats. Composer Daniel Pemberton doesn’t just give us a cheesy pastiche of the genre though. What he has provided is a swing funk drum soundtrack to rival David Holmes work on Ocean’s Eleven mixed in deliciously with some Roberta Flack and Nina Simone. 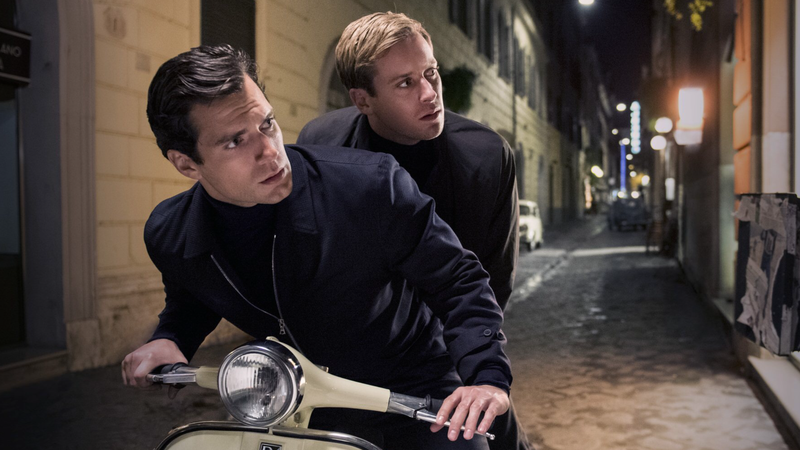 If you go into The Man from U.N.C.L.E expecting breathtaking car chases, thrilling fights and complicated plotting then you may be disappointed. 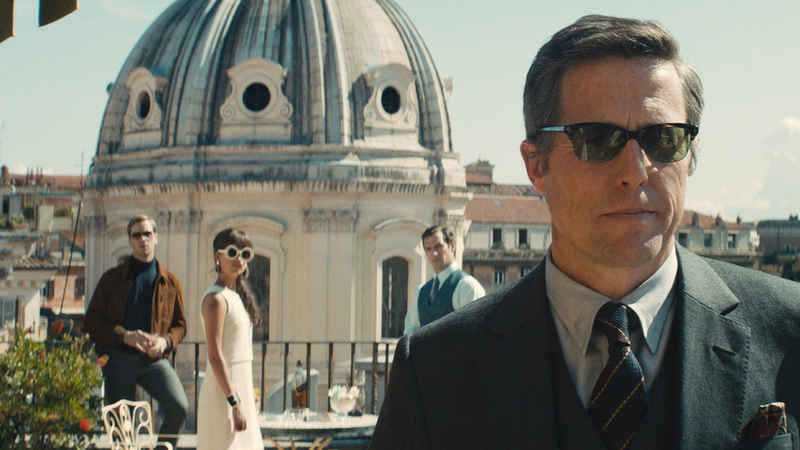 If, on the other hand, you want a classy spy film like the ones they used to make then there is much to enjoy here, for adults and older children alike. It is one for the kids. It is a 12A but once again features the levels of bloodless violence typical for this certificate. There are some more grizzly deaths but they happen off screen and there are quite a few sexual innuendos. There is a chance these may go over heads of some children though, they are marginally more subtle than the ones we used to get from Roger Moore. Armie Hammer and Henry Cavill may not be the men we want then but they do well enough and actually work quite nicely as a pair. They are well supported by their fellow cast members, not only Alicia Vikander and Hugh Grant but also Elizabeth Debicki as the femme fetale, and they are effectively backed up by the direction and writing. There are some nice touches like when Solo, knowing he has been drugged, prepares to pass out on the sofa with his head on a cushion and when Gaby, knowing she is drunk, decides to wrestle the uptight Kuryaken. It may not be one to rush to see at the cinema but your mission is to catch it at some point it you can. You’ll certainly want to see it before the sequel and they’ve tantalised me enough for me to want there to be yet another one of those. Right, what’s next? Let’s see a big screen version of The Littlest Hobo please.